NUS Geog Soc: FASS Career Day 2013- Three Events in one day! 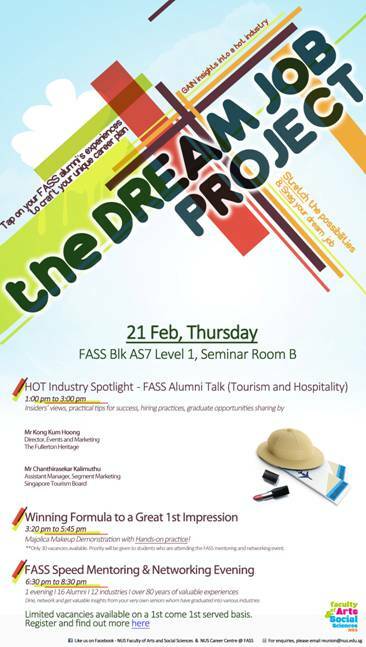 FASS Career Day 2013- Three Events in one day! TOURISM and HOSPITALITY is a career field very popular with our Geography Students! If you are interested to work this sector, please come along for a FASS Alumni Talk (spotlight on Tourism and Hospitality) this Thurs (21 Feb), 1-3pm, AS7 Seminar Rooms ABC. Two FASS alumni working in tourism/heritage development will be here to talk about their work experience, and entertain questions you might have! On the same day in the evening 6.30pm onwards, 14 FASS Alumni will also be on hand to network with you and talk about their career sectors over an informal dinner session. This is the FASS Speed Mentoring and Networking Evening (Thurs (21 Feb), 6.30-8.30pm). The career sectors include: aviation, business consultancy, communication and media, education, gaming, international relations, NGO work etc. Click on the poster for more information and registration. I am most certain our Geography majors will find these career talk/networking event extremely beneficial as you contemplate your post-NUS career options.